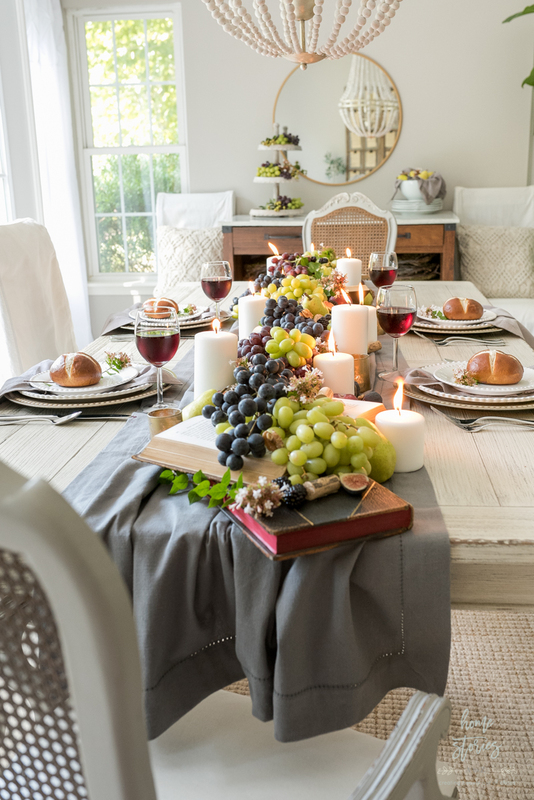 Beautiful and bountiful early fall tablescape filled with fresh fruits, flowers, and candles. 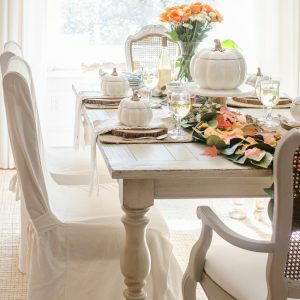 Steal this inexpensive and unique book table runner idea! Confession time. I am currently fighting the temptation to begin this post with an apology to you for the copious amounts of pictures contained within this post. However, I realize that every single darn fall I find myself apologizing at the beginning of my posts for the copious amounts of photos—and today I’m not doing it! 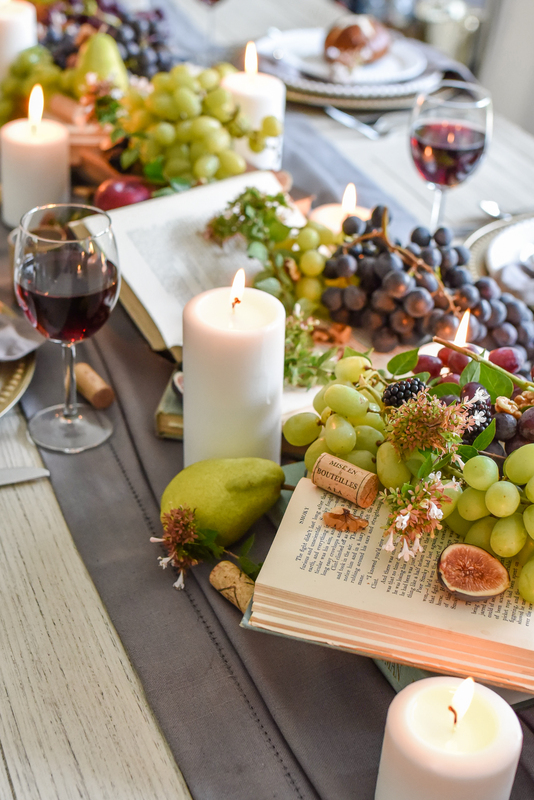 So instead, just know that this post contains beautiful imagery which hopefully inspires you to create beauty in your own home and on your own table! 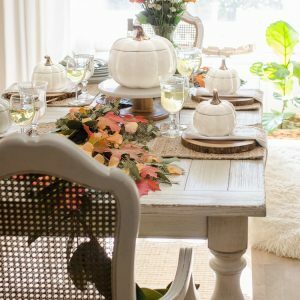 And since fall is all about bounty, there are even 15 other gorgeous fall tables linked at the end of the post by a dream team of talented bloggers. So  much  beauty ! 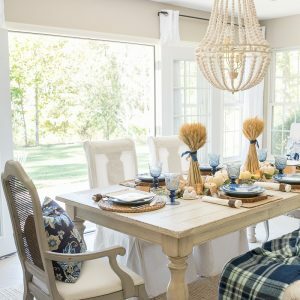 Be sure to click the links at the end of the post to visit the tables that catch your eye and pin your favortites! It’s true. The bountiful harvest of fall stirs my creative juices like no other time of year! Fall provides me with so many props to play with, and tables are my favorite blank canvases to “paint”. 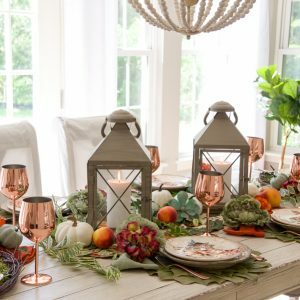 I wanted this table to capture the essence of early fall—the hygge of fall if you will! 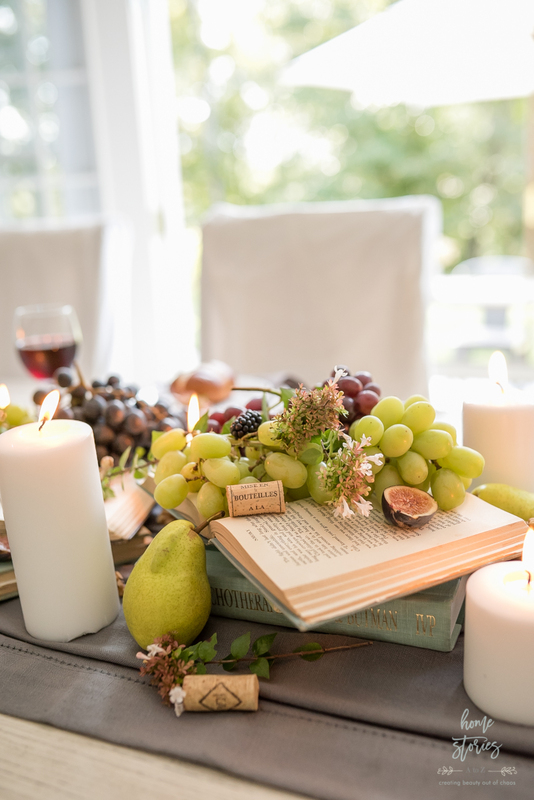 Think laughter by candlelight, bountiful harvests of fruits and flowers, and cozy evenings with wine and good books. 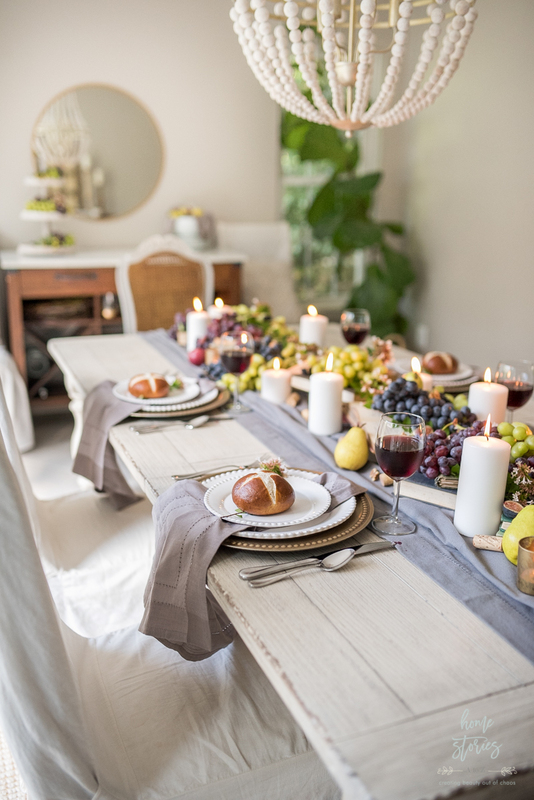 I was really inspired by the work of wedding stylist Janna Brown Design to create a bountiful fall harvest theme using pears, grapes, figs, plums, blackberries, and walnuts. 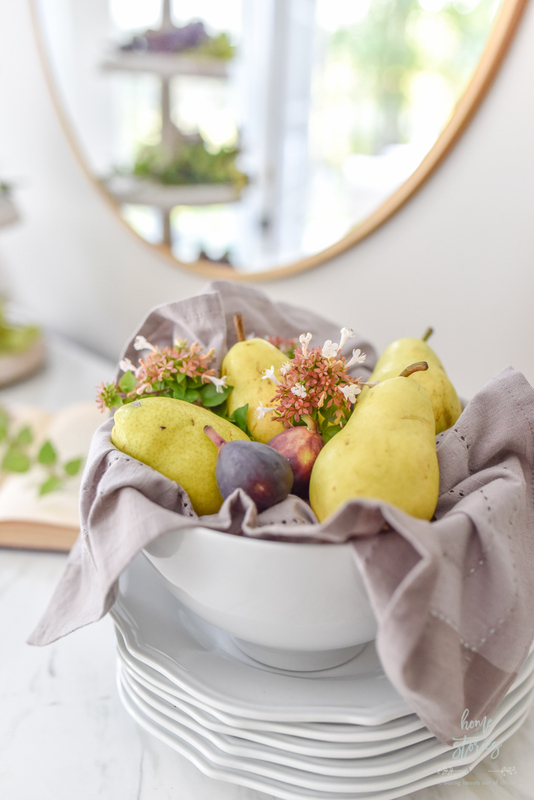 The benefits of using fruits in decor is that you get to eat all of your props when you are finished shooting! We will have grapes for daaaaays!  Fortunately, they freeze well and taste amazing frozen. The candles on the table are all from Walmart. They have great prices on unscented pillar candles from the Mainstay brand, and they come in both white and cream. I buy the three packs of the varied height pillars and use them all the time in my decor. They burn clean and seldom drip. 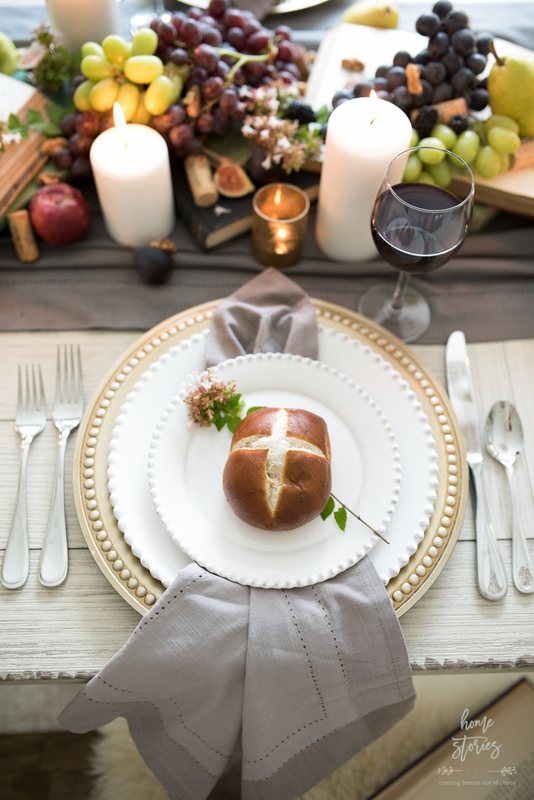 It’s also important to burn unscented candles for your meal! All of the fruit on my table came from Lidl! If you don’t have a Lidl yet in your area, I’m so sorry. You’re missing out! Lidl is very similar to Aldi but (in my opinion) better. Just like Aldi, their produce is incredibly inexpensive and most of it is organic. They also sell a great array of wines. I was thrilled to find black figs at Lidl! They are so delicious as a snack and also taste amazing with grilled chicken. Cut the figs in half, top with herbed goat cheese, pop under the broiler for a few minutes, and then top with balsamic glaze. Serve a few broiled figs over your grilled chicken and thank me later! 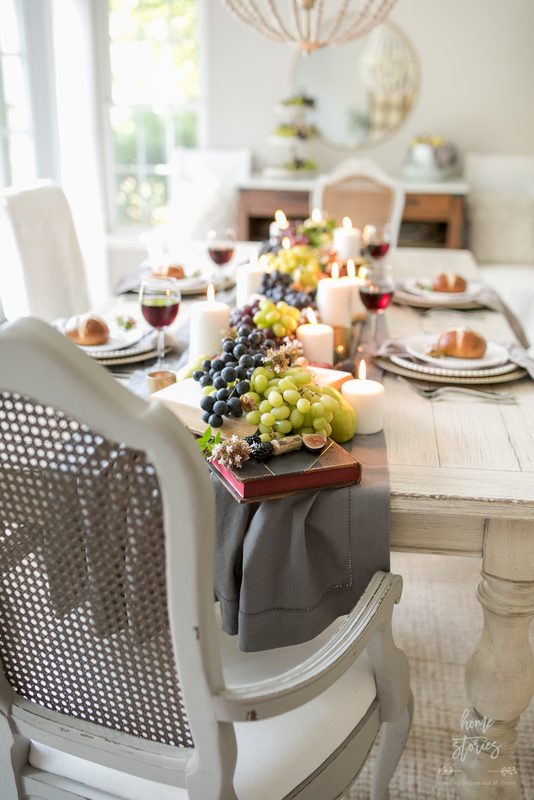 On this evening, I didn’t finish shooting the table until late but we still ate dinner at this gorgeous table. It was pretty amusing! I’ll share it on my Instagram stories. We just had hamburgers, salad, and the buffet of fresh fruits in front of us. It was so fun to munch on the table runner! 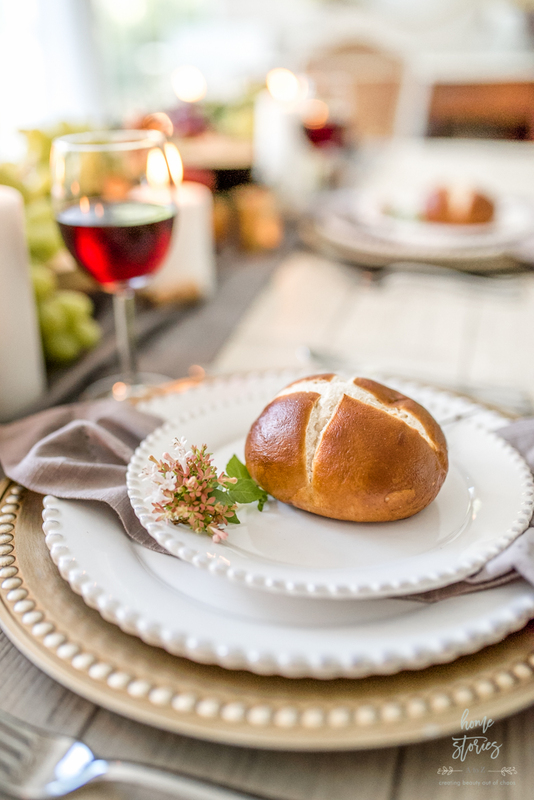 The pretzel rolls are also from Lidl. We used to eat a lot of pretzel rolls when we lived in Pennsylvania and the kids were missing them. Lidl has an amazing bakery, so I always pick up a loaf of bread or some cookies for my boys. I’m still eating a ketogenic diet, so I just admired the beauty of my roll from afar! One of my favorite things about our new home is the dining room. Our dining room french doors open up to our patio, and it’s so nice to be able to let in all of the beautiful natural light! South Carolina has some impressive bugs, so I don’t leave the doors open very often, but the fall is a lovely time to dine in here with the doors open. 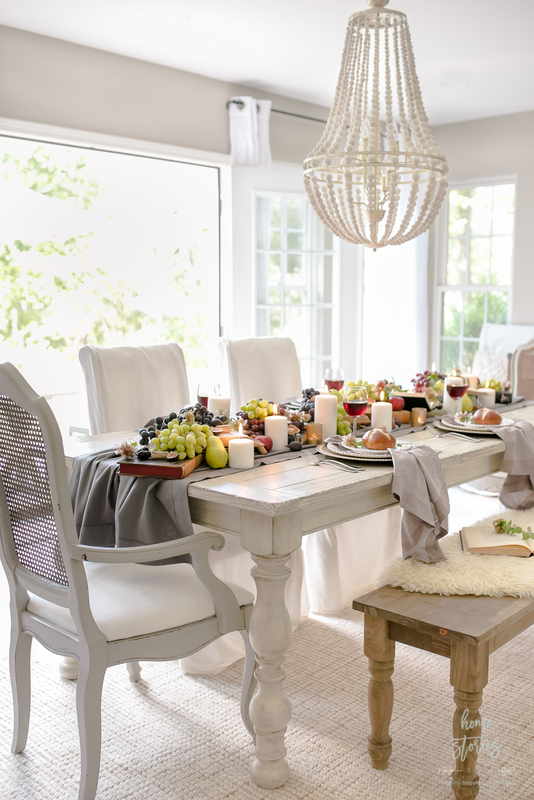 The gray linen table runner is actually a tablecloth from HomeGoods bunched up to create a runner. The napkins are from Pier 1 and I love them! I have them in a few other colors as well. They wash up nicely and are beautiful. The plates are from Birch Lane purchased several years ago and the gold chargers are BHG Walmart. The gold mercury glass tea lights are an easy DIY and worth checking out! The flowers are just clippings from some bushes in our yard. The butterflies love these flowers! If you made it this far and are still with me, you deserve a gold star, or a high five, or perhaps some fruit and a glass of wine?! Thank you so much for stopping by and allowing me to share my latest creation with you! I hope you enjoyed my copious amount of pictures!  I’d love to have you follow me on Instagram @homestoriesatoz to keep up with me daily. 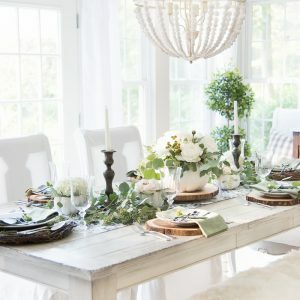 Now be sure to stop by my friends’ blogs and be inspired by the gorgeous tables they set just for you! Beth, this table is so incredibly beautiful! 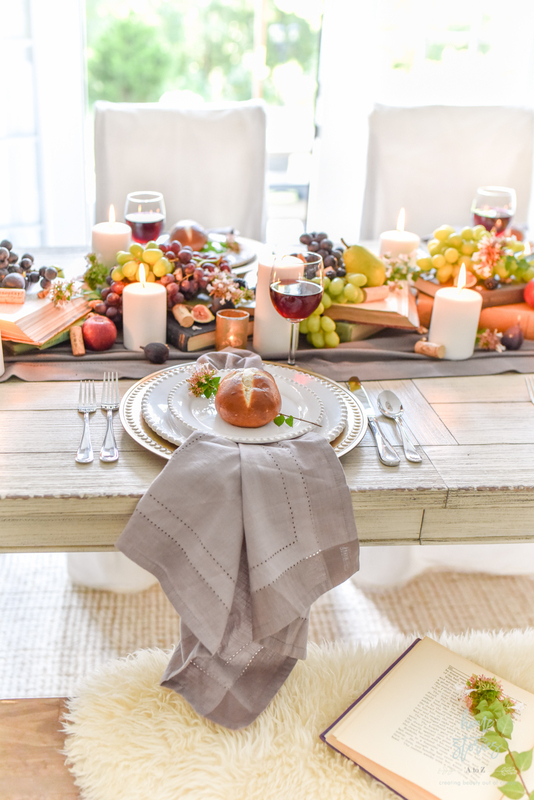 I love all the details like the books, wine corks and your mention about the candles. 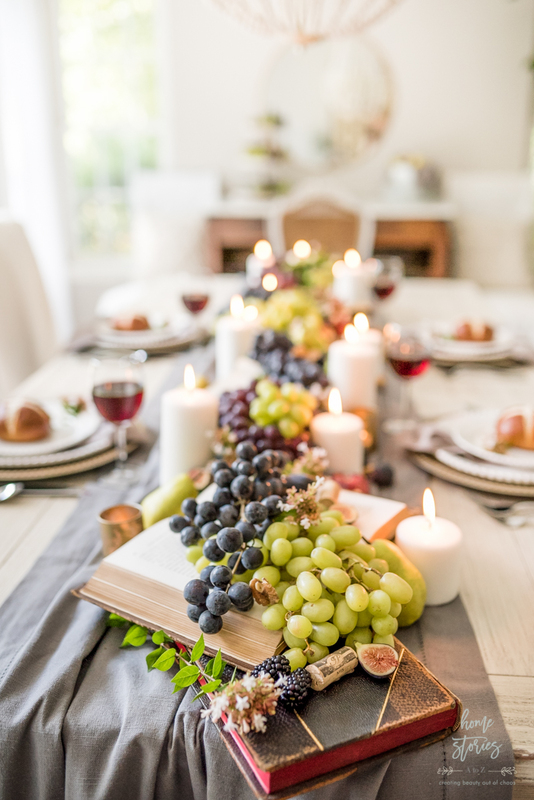 I agree with burning only unscented candles at the table so they don’t distract from the food. Nice to know Walmart carries some good ones. 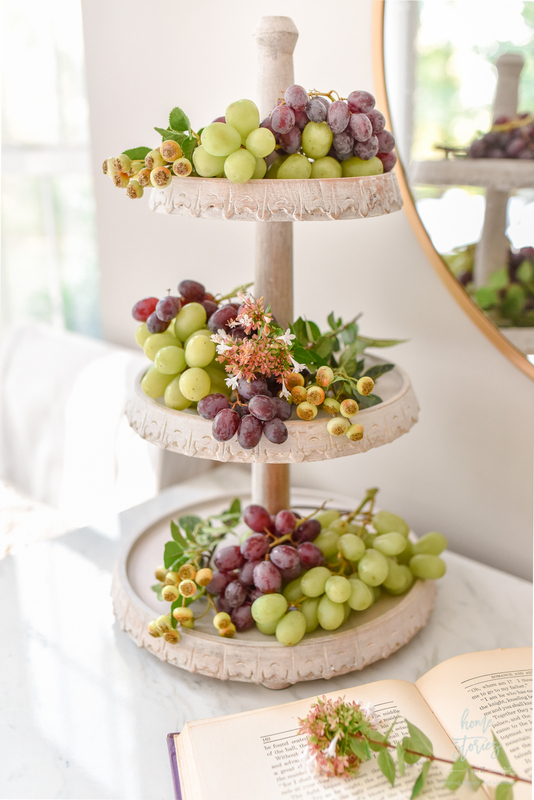 I love the tiered stand with the grapes on the buffet table too – so so pretty! This is SO beautiful! 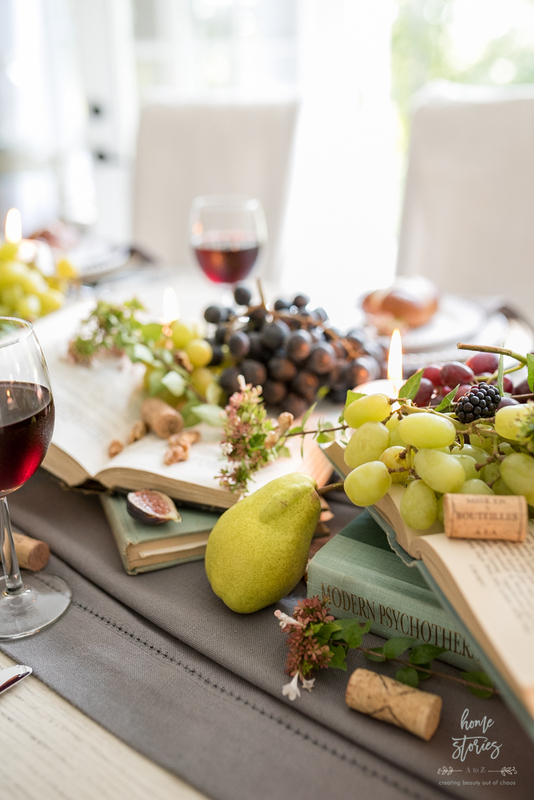 Love the grapes combined with the books, cozy and lush. Thanks for sharing! I absolutely love the book idea…it’s so pretty! And your pictures are stunning. Love! Amazing Beth! You make a mother proud! This is so beautiful Beth! 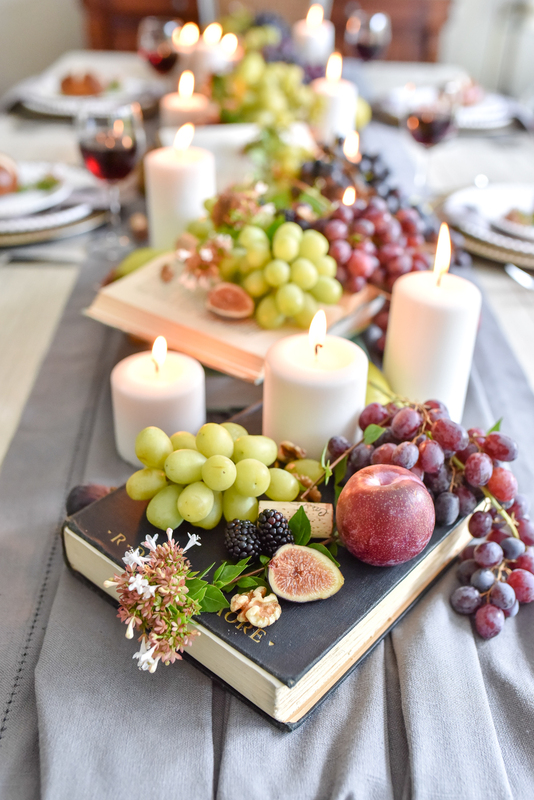 I love using all natural and edible produce for the centerpiece! What a charming and elegant table. Just love it. PLEASE, share where you bought the dining room rug. I HAVE TO GET ONE Thank you in advance. 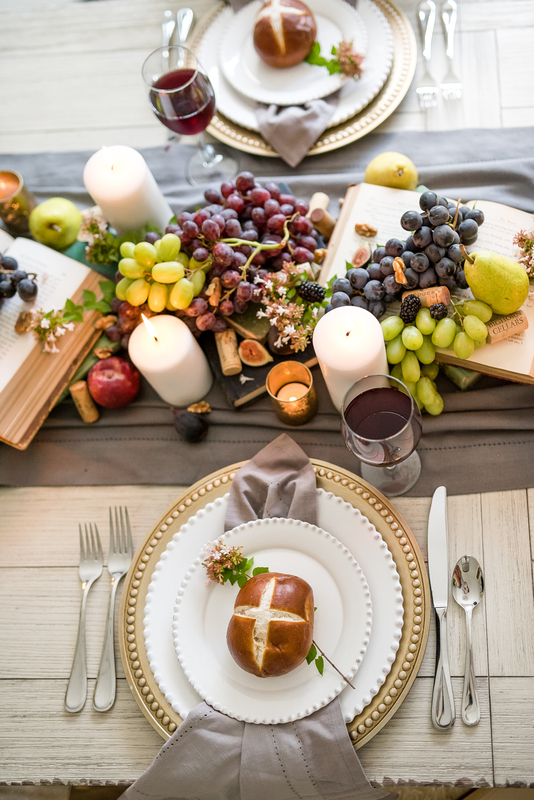 The books as a centerpiece are so fun and unique! I love this ideas!! This is stunning Beth! The colors are magical. So lovely!! So well done! !